Embattled Deputy FBI Director Andrew McCabe is scheduled to retire on Sunday with a full pension unless Attorney General Jeff Sessions decides to fire him by 5 p.m. Friday. McCabe is accused of allowing political bias to interfere in the FBI's criminal investigation of former Secretary of State Hillary Clinton and leaking confidential information to the media. He is also accused of lying to investigators about his contact with reporters and abusing the FISA system to spy on Americans associated with the Trump campaign. McCabe was recently recommended for termination by the FBI Office of Professional Responsibility after Department of Justice Inspector General Michael Horowitz, who is expected to release a full report about the way the FBI handled the Clinton email investigation, reportedly found severe wrongdoing. 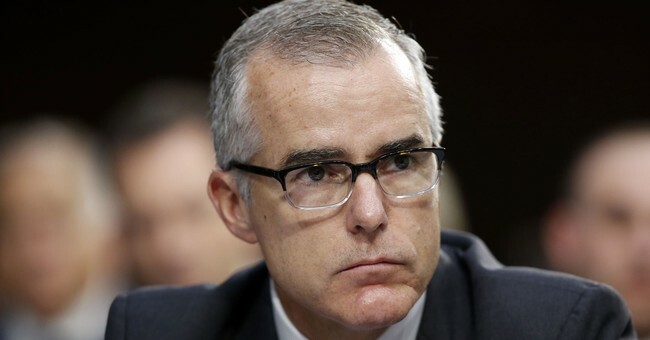 But while McCabe may be worried about losing his pension after 22-years at the Bureau, George Washington University Law professor and Democrat Jonathan Turley says he should be more concerned about criminal charges. He also pointed out the double standard between McCabe and former White House National Security Advisor Michael Flynn, who was charged with lying to the FBI as part of Special Counsel Robert Mueller's investigation into the 2016 presidential election. He pleaded guilty to the charge last year. "The real strange thing about all of this is that McCabe so far has been so far more worried about pensions than prison. That's not the choice that was given to Michael Flynn. Michael Flynn, if you recall, was charged with false statements even though Comey's investigators reportedly believed that Flynn didn't intend to mislead them," Turley said during an interview on The Story. "That's not apparently the conclusion of the inspector general with regard to McCabe." "Part of the interesting contrast as well is that Michael Flynn was accused of misleading investigators about something that wasn't illegal, not even unprecedented. The meeting with Russians didn't violate a law," Turley continued. "What McCabe did was a violation."